When it comes to the professional performance of a person, it is important to evaluate it at regular intervals. This gives him and his senior management an idea of his strengths and weaknesses, thereby giving a chance to improve. Evaluation forms are used precisely for this purpose. Based on the field of work of the person, he should be evaluated on various parameters. Evaluation Forms comprise of all these parameters, thereby simplifying the process of evaluation. An organization evaluates the performance of its employees at regular intervals to check if they are fit for promotions and pay hikes. 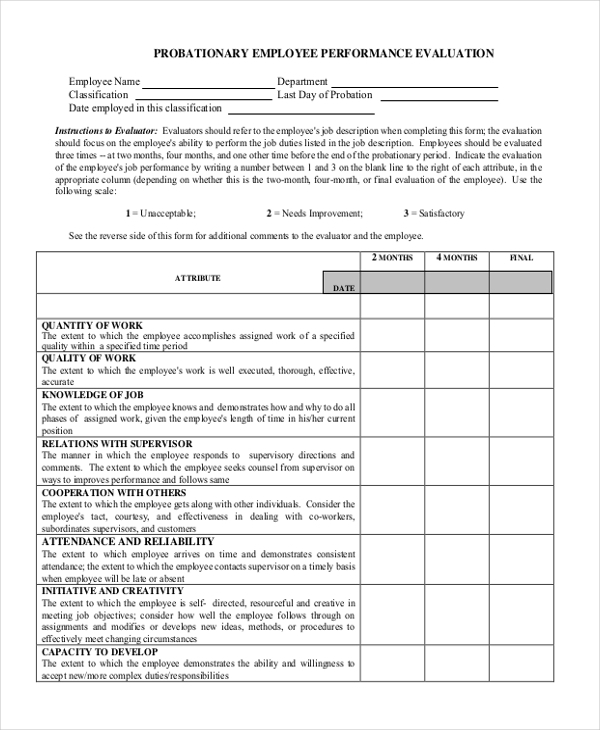 The Employee Evaluation Forms with all the relevant parameters in place is used for this purpose. This form is used by educational institutions to enable their teachers to evaluate the students on the basis of various parameters over a period of time. 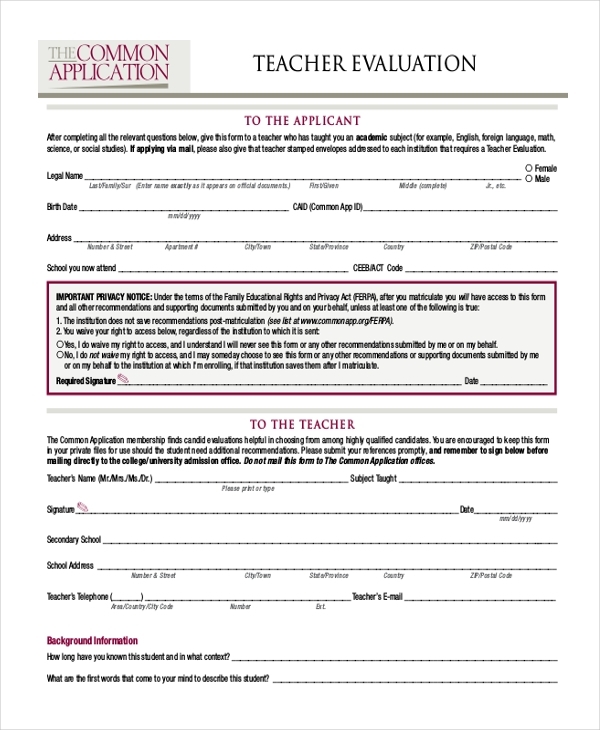 The teacher is required to record her opinion in this Teacher Evaluation Forms and submit it to the management. When an organization places an employee on probation, they conduct an evaluation of his performance after the probation period. This helps them to decide if the employee is fit for the organization. The aforesaid form is used for this purpose. 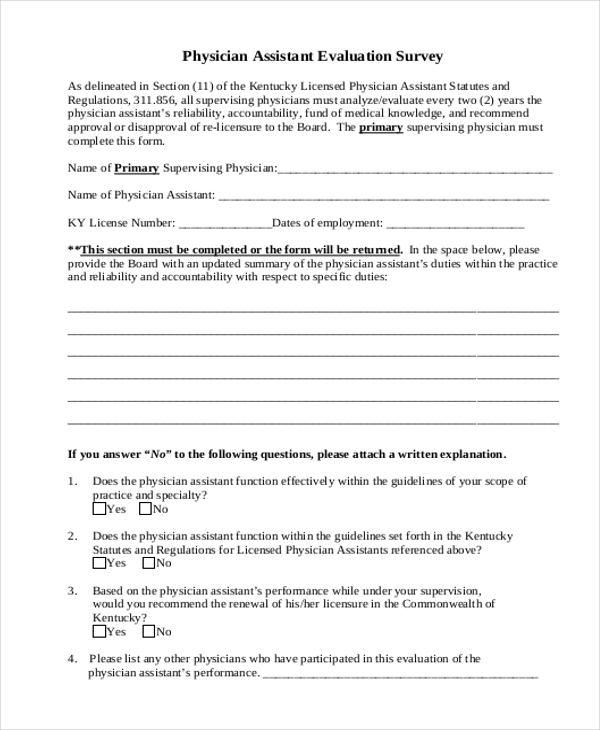 As the name indicates, this form is used by government agencies to conduct a survey of all the physicians’ assistants in a particular area and evaluate their professional caliber and performance. 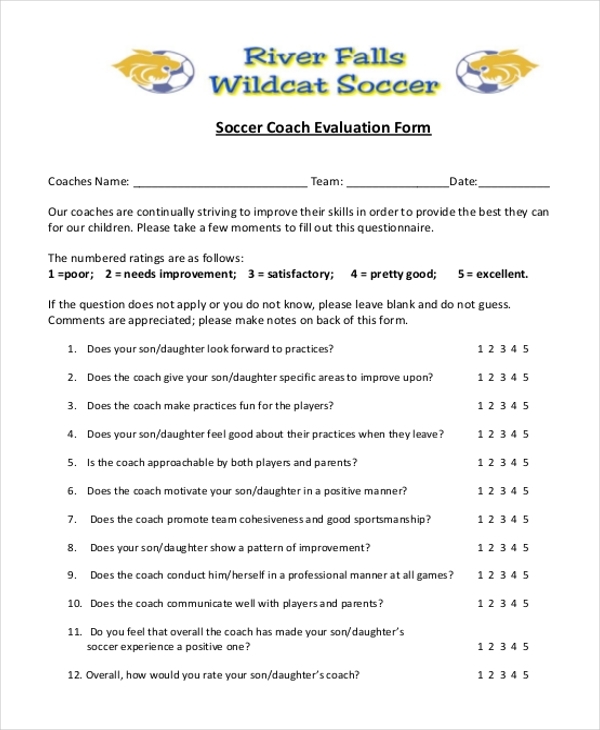 This form is used by schools, colleges and sports clubs to evaluate the performance and abilities of a soccer coach over a period of time. The form contains all the important parameters against which the coach should be evaluated. 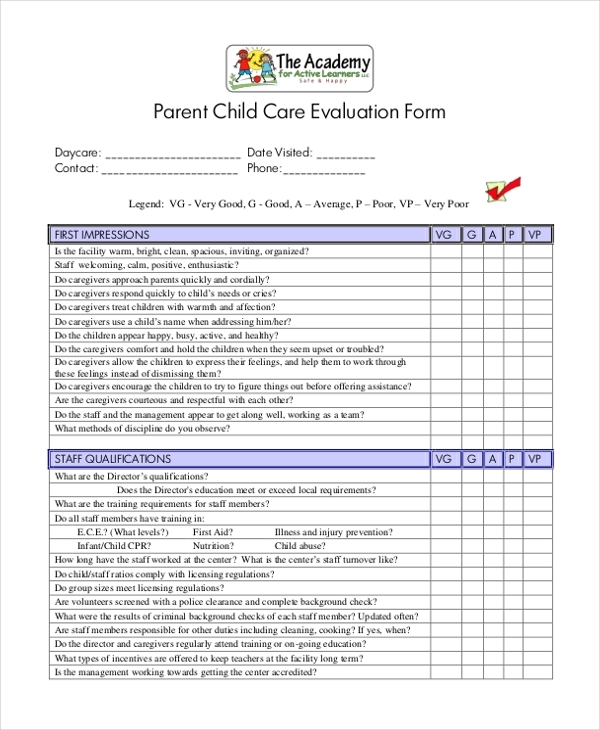 Child care agencies make use of this form to understand what the parents think of their services. These forms comprise of various segments which need to be filled in by the parents with relevant information which in turn can be used to improve the services. 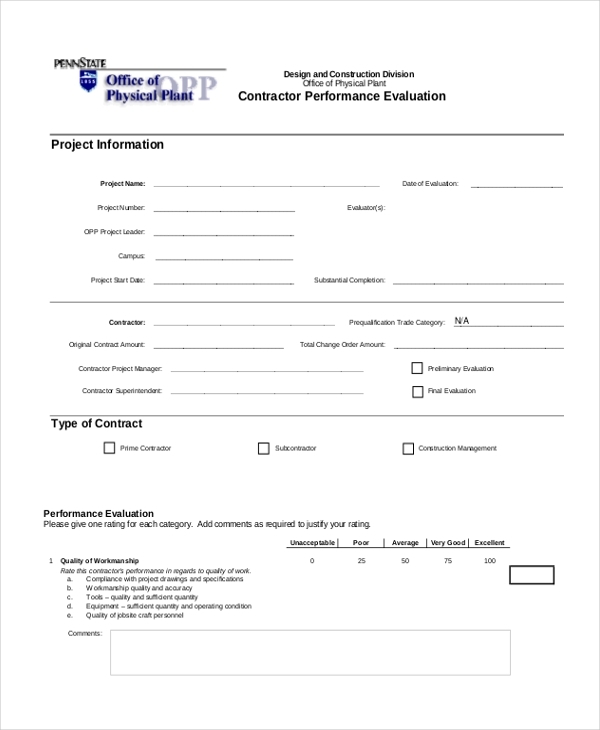 This form is used by organizations where projects are handled by teams. These are also used in group activities. The form is basically used to let the team members evaluate the other people in their group based on the various parameters. Contractors and service agencies make use of this form to understand what their customers think of their services. With all the crucial parameters in place, the customer just needs to fill in his opinions in the form which helps the contractor to improve. you can also see Presentation Evaluation Forms. 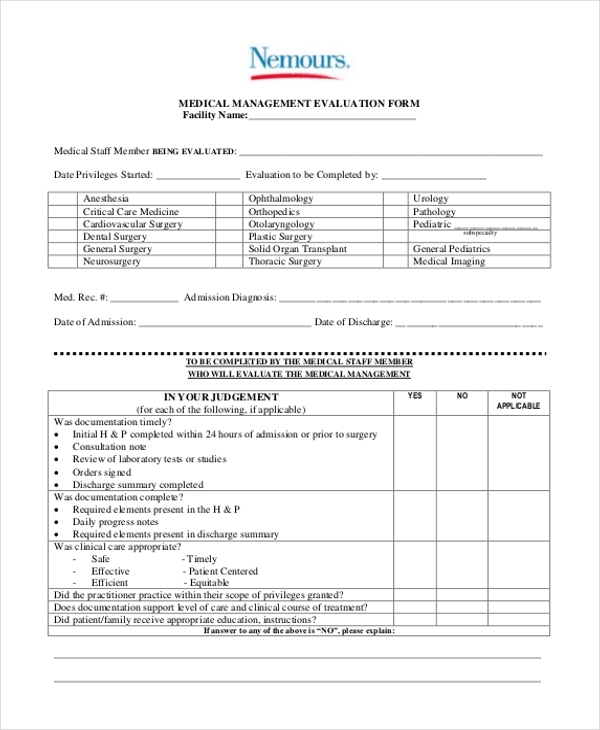 This form is used by hospitals and medical care facilities to evaluate the skills and performance of their staff members. The person conducting the evaluation is required to put queries to the staff and then fill in the form with relevant information. As the name indicates, this form comes in handy for person who wishes to analyze his skills and performance over a period of time. This Self Evaluation Forms helps him to understand his positive and negative traits which in turn can help him rethink his strategies. What are The Benefits of Using Evaluation Forms? Need help to design an evaluation form? Why not check out our range of these forms? 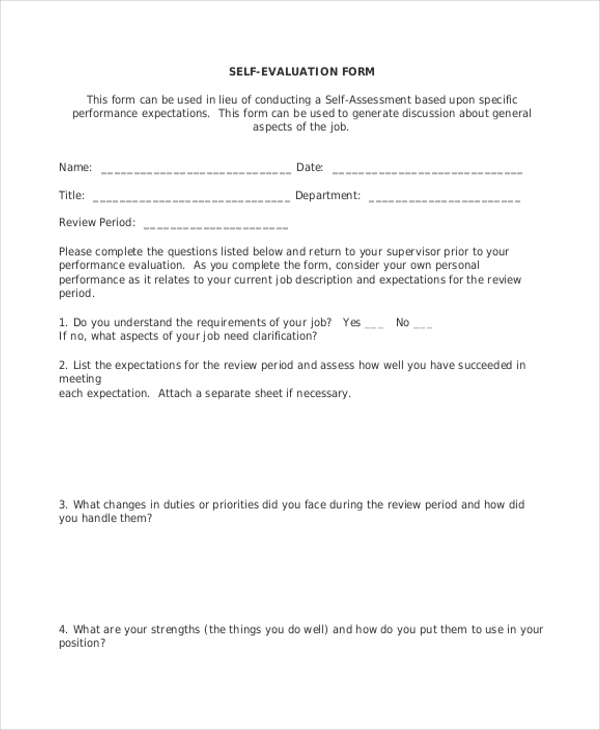 We have everything from Training Evaluation Forms to self evaluation forms. So, finding the one that is apt for you would be easy. You can quickly download the form of your choice and customize it to come up with a unique evaluation form.